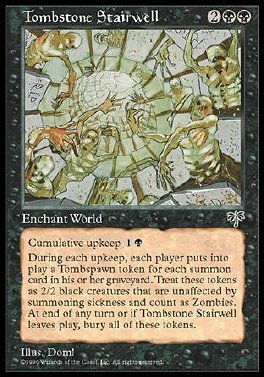 Cumulative upkeep 1B At the beginning of each upkeep, if Tombstone Stairwell is in play, each player puts into play a 2/2 black Zombie creature token with haste named Tombspawn for each creature card in his or her graveyard. At end of turn or when Tombstone Stairwell leaves play, destroy all tokens put into play with it. They can't be regenerated.